I am so happy to share this new clip art graphics set with you called Pearl's Snowy Pearadise! Meet Pearl, she is a little piggy who loves pears and everything is a "pearadise" to her, especially holidays where there are pears to eat. Pearl’s Snowy Pearadise Holiday Graphics Kit comes with a massive collection of Christmas watercolor and solid fill elements, plus wreaths, tons of patterns, scene creating buildings and background items, premade card designs, and lots of darling accessories for Pearl to wear! There are over 150+ items in this kit including the predesigned versions of Pearl’s accessories! 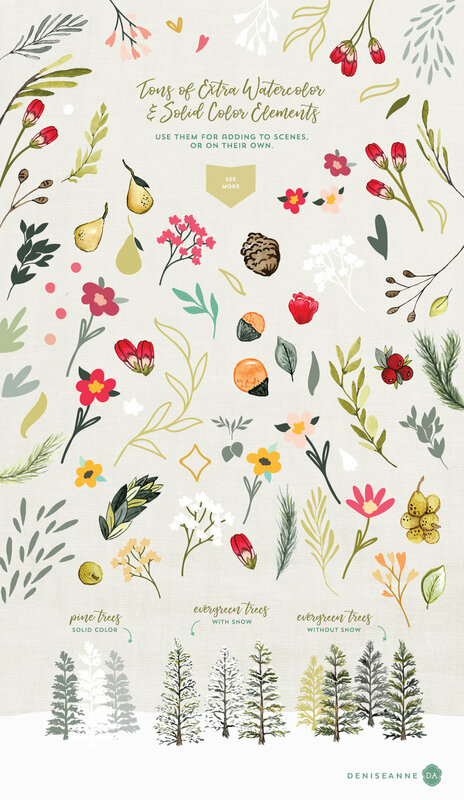 Plus there are tons of individual elements to add into your designs with Pearl, including watercolor evergreen Christmas trees, watercolor Christmas farm inspired flowers and wreaths, and I couldn't forget Pearl's favorite snack pears! Go take a look at the rest of this huge holiday Christmas clip art set available here on my web site, and also in my Creative Market shop. Pearl and I wish you a wonderful holiday season and we would love to see what products you create! let me know in the comments or contact me. Happy creating!